Lil Dagover (left) and Friedrich Fehér (right). B&W : [?] Five or Six? reels / [?] 4682 feet or 1703 metres? Decla Film-Ges Holz & Company production. / Produced by Erich Pommer and Rudolf Meinert. Scenario by Carl Mayer and Hans Janowitz, from a screen story by Hans Janowitz. Production design by Hermann Warm, Walther Reimann and Walter Röhrig. Costume design by Walther Reimann. Assistant director, Rochus Gliese. Stunts by Harry Froboess. Cinematography by Willy Hameister [?] + Karl Freund? Music score composed and arranged by Giuseppe Becce. / Premiered January 1920 in Berlin, Germany. Released [?] 26 or 27? February 1920. / Standard 35mm spherical 1.33:1 format. / The production was shot at the Lixie-Atelier studio, Weißensee, Berlin, Germany. Dagover’s film debut. The film originally had intertitles shot in an angular style to be consistent with the angles in the film’s sets. The film was released in Poland as Gabinet doktora Caligari by Sfinks in 1920. The film was released in Sweden on 21 February 1921. The film was released in the USA by Goldwyn Distributing Corporation on 19 March 1921. The film was released in Japan on 14 May 1921. The film was released in Mexico on 8 December 1921. The film was released in Finland by Suomen Biografi Osakeytiö on 30 January 1922. 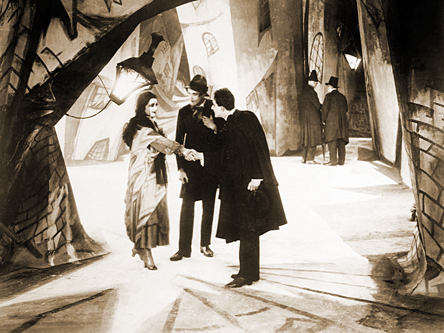 The film was released in France as Le cabinet du docteur Caligari on 15 March 1922. Survival status: Print exists [35mm positive]. Current rights holder: Friedrich-Wilhelm-Murnau-Stiftung [Germany] : Public domain [USA release version]. References: Film viewing : Amberg-NYTimes p. 3; Aylesworth-Monsters pp. 76-79, 137; Baer-Film p. 37; Bardèche-History pp. 46, 88, 150, 179, 188, 190, 191-192, 194, 195, 227, 251, 375; Barry-Griffith p. 46; Bogdanovich-Dwan p. 50; Bohn-Light pp. xxi, 122, 124-126, 127, 129, 133, 138, 160; Brownlow-Parade pp. 510, 524; Card-Seductive pp. 12, 62, 65-71, 78, 81; Everson-American pp. 4, 14, 58, 173-174, 317, 323; Fell-History pp. 128, 133-134; FilmYearBook-1926 pp. 20-21; Gallagher-Ford p. 51; Hirschhorn-Universal p. 76; Jensen-Lang pp. 12, 19-20, 22, 23-24, 26, 33, 38, 41, 68, 90, 111, 135, 146, 156; Kael-Kiss pp. 242-243, 317; Kerr-Silent pp. 28, 282; Lahue-Collecting pp. 9, 34-35, 48; Leish-Cinema p. 33; Limbacher-Feature p. 35; Maltin-Guide p. 175; Manchel-Terrors pp. 21-25, 34-36, 42; Marrero-Vintage pp. 8, 13, 25, 43, 156; McGhee-Wayne pp. 108, 242; Nollen-Karloff pp. 33, 48, 120; Perry-British pp. 50, 52; Sarris-Sternberg p. 6; Shipman-Cinema p. 70; Sinyard-Silent pp. 154, 159, 161; Sklar-Movie pp. 100, 292, 306; Taylor-Hitchcock p. 41 : Cinemonkey-16 p. 18 : Website-IMDb.